Mexican cantina meets Star Wars. The wall art at Mags 99 has come a long way since the original, solo fish poster, but the chicken has always been delicious. The banner came down in 2002, and Squamish has begun to clean up its act in the years since, becoming an epicenter for climbers, hikers and mountain bikers. But something still separates the town from other such outdoor hotspots: the logging, mining and blue-collar workforce that makes up its roots, bringing together two distinct social scenes that don’t interact often. And if those two scenes had a love child you could eat for dinner? Well, that progeny would be Mags 99 Fried Chicken and Mexican Cantina, the essential place to end a ride in the land of loam, logging and singletrack. Born and raised in Penticton, BC, Lawton spent 20-plus years as a chef, working everywhere from Vancouver to Alberta, Australia, England, and France. Mags 99, however, was his first stab at running his own restaurant. To judge from its parking lot, it’s a success. Head in on any summer day and you’ll find a mix of shuttle rigs, van-lifers and commuters headed to Vancouver. Mags 99’s location is key—it’s the last food stop on the way to the city, it’s at the base of the Valleycliffe trail system, and is a stone’s throw from the Chief, one of North America’s iconic climbing spots. But much of the restaurant’s popularity is due to Lawton’s forward thinking. 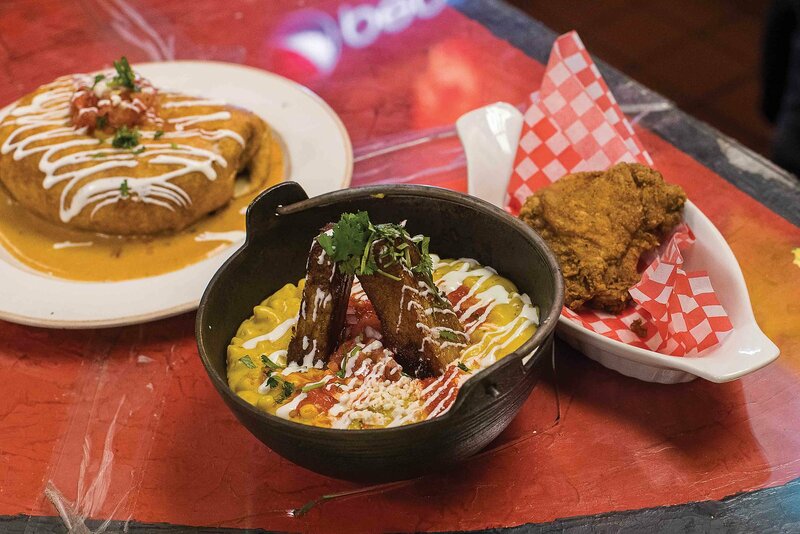 Massive burritos, deep-fried delight, and a full veggie-friendly menu—whatever you want, Mags 99 has you covered. Doing so first required a lot of work, and on a tight budget. Lawton roll-painted and cleaned the entire restaurant himself, surviving on soup for the six months before opening. As it was formerly a KFC/Taco Bell, there happened to be a deep fryer in the kitchen. What did Lawton do? Add an early 1980s pressure cooker to the arsenal, and Lawton and his team are well-equipped to serve up some of the best fried chicken in the Sea-to-Sky Corridor. Mag 99’s interior design would probably make Martha Stewart gag, but for the eclectic crowd who dines here that’s what makes it great.